There are some amazing Black Friday and Cyber Monday sales going on out there today and I’ve gathered up the best vintage sales and discounts around for you to enjoy! I’ve ordered them by discount, starting with highest first, but make sure you don’t miss out on the special offers and sale section at the bottom of the page too! If you know of any I’ve missed please add them in the comments below! 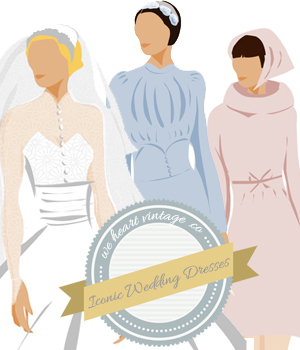 This offer is astonishing – The Best Vintage Clothing are offering a massive 50% off their store in an offer together with vintage blog: Cakes & Cakes Vintage. They have an amazing range of vintage, from Victorian antique clothing, to genuine 1920s and 30s vintage dresses, mid-century fashions and fabulous vintage from the 60s, 70s and 80s too. The offer is only available for 3 hours though so make sure you don’t miss on this one! Jenstyle specializes in eclectic vintage finds. Bright, bold, and making a statement! From women’s to men’s to children’s vintage, you’ll find something memorable at jenstyle. 40% off on Friday!!! Vagabonds specialises in vintage, thrift & fair trade clothing with a devotion to current trends and grunge revival. 30% off across all my Vintage items at www.vagabondsvintage.com going live Thursday AM for Black Friday. Le Keux Cosmetics sell beautifully packaged, vintage inspired cosmetics and make up brushes including high pigment lip paints and eyeliner. Formulated by the experts behind Le Keux Vintage Salon. Their range helps you help you create the vintage look at home. Black Friday 30% off all cosmetics and make up brushes ordered between Friday and midnight Sunday. Code is BLACKFRI, website is www.lekeuxcosmetics.com. HONEY MOON MUSE is a collection of vintage clothing & accessories curated for the vintage junkies & the fashion mavericks. Their store focuses on 80s & early 90s vintage with an emphasis on style, quality & originality. We sell to the young and young at heart, petites through to plus sizes. 20% Off Everything. My Holiday deal for my shop is 20 % all items through Dec. 15 including any new items. Crabtulip an online vintage and antique boutique selling an eclectic range of antique and vintage fine and costume jewellery, vintage collectibles, vintage women’s clothes and handbags, vintage home wares, retro ornaments and much more! Mid century up to 1980s. 20% discount coupon sale for Black Friday – Cyber Monday in my Etsy shop. Code: BFCM14 – www.etsy.com/uk/shop/crabtulip. The sale will run Wednesday November 26th through Tuesday December 2nd. No code to enter, discount will be taken in the shopping cart. Love Charles sells classic vintage clothing from the 1920s to the 1980s. There are always lots of separates in stock for anyone trying to build a vintage wardrobe. 20% off for Black Friday through Cyber Monday. Queenies Bazaar showcases a diverse and exciting collection of the finest vintage jewellery in the UK from well know designers and vintage brands. Luxury vintage jewellery hand picked for it’s charm & beauty for everyday wearing, vintage inspired weddings and the discerning collector. Including a range of individual handmade jewellery & sterling silver. 10% discount with coupon code 10 plus free shipping on all UK orders. Microbio is all about colorful, classy and cute handbags & purses with a vintage inspiration. Microbio makes one of a kind handcrafted pieces and ships to selected countries worldwide from its sunny home studio. 10% off on entire webstore when using code BFCM14 at checkout. Real quality vintage from the twenties to the eighties for weddings and parties or just for being smart, all cleaned conserved and ready to wear. £20.00 discount voucher for your readers for separates, suits and coats using the voucher code ‘Heart’ on checkout. Valid until 1st December 2014 only at www.realgreendress.com online shop. All products subject to availability. Free UK postage. Classic Menswear is dedicated to sartorial men’s clothing that is becoming increasingly difficult to find on the high street. The Lloyd Attree & Smith brand was established in 1857 and to this day still makes items such as cravats, nightshirts, driving gloves, tweed waistcoats, luxury jacquard dressing gowns as well as the traditional bowtie. http://www.classicmenswear.co.uk/acatalog/Backed-Scarves.html these are luxury Pure Wool and 100% silk scarves; these are reduced from £50 to £30 with FREE UK Delivery. Phew! I think that’s everything! If you have any more codes please add them in the comments below! Let’s hear it for Black Friday sales!